Las Casas Filipinas de Acuzar - A step back in time! It took us about four (4) hours to get here, but it was all worth it. Las Casas literally transported us back in time. Las Casas Filipinas in Bagac Bataan is home to centuries old houses restored to their former splendor and glory by the owners of the resort. The Pavillion adored by cute cherubims - want to take home!!! The Las Casas package comes with a one hour historical walk around its cobbled stone streets. The tour was both entertaining and educational. 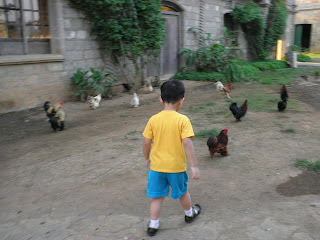 My kiddos were really listening to each of the houses' colorful past, as they run around the huge resort's ground. Want to bring home a chicken! I recommend Las Casas, if you are looking for a worthwhile trip where your family can have fun and an appreciation of his heritage and culture.